Have you noticed the lovely giant mural on Man Nin Street in Sai Kung? This is the latest work by Chan Ying-fat, so we asked the local artist how he enjoys painting in Sai Kung. What do you like about Sai Kung? Living in Sai Kung for more than one year, I really enjoy the cosy atmosphere. People are friendly and the natural environment always makes me feel peaceful and comfortable. It really helps me create my work, I’m able to focus on drawing and have more space for inspiration. Among the different kinds of art, what do you like about murals? I actually started my career doing oil paintings, then shifted my focus to murals in recent years. My main motivation comes from interactions with people – I like when people get involved with my paintings, evoking in them an interest in art and creation. Can you share the inspiration behind the mural on Man Nin Street? This mural is all about street fun! It’s an illusional picture, where pedestrians can be characters. I kept the gray wall color and didn’t put in a full background, so people can realize it is still the original wall and also a graffiti wall now! 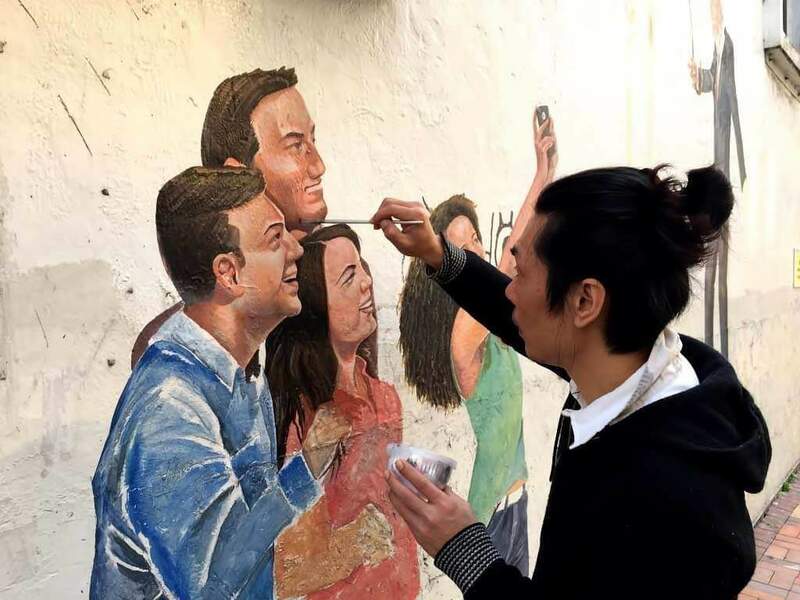 What are some of the challenges you have encountered painting murals in Hong Kong? Finding places to paint is still the biggest problem we have to deal with. If we want to paint a public wall, we have to deal with different government departments and the process is painful. Most of the shops in Hong Kong welcome us painting their private walls or in front of their doors, but sometimes people will think the painting is commercial, so we have to strike a balance.